Do you have a cutie patootie? Free Shipping at Kelly's Closet! This is, sadly, my last planned entry here. :( Being a busy momma to two (soon to be three! ), keeping my home, teaching my son, and doing all the other things that I love to do, not to mention keeping up with our family blog, this is proving to be too much. Plus, I'm at a place in my cloth diapering journey where my new experiences are kind of stalling out. I have a system I like, I have my brands I prefer, and I'm not in a position (financially) to be trying all sorts of new things just for kicks. Even though I'd like to. You may be fortunate enough to live somewhere with a brick-and-mortar cloth diapering store. All this means is that you have an actual store building somewhere in your town or within a reasonable driving distance. I am not so fortunate; in fact, I don't know of anywhere in the state of GA that sells any cloth diapering stuff, save for a small midwifery practice, but they're far away from me and don't have a wide selection. No, the truth is that if you're wanting to buy some fluff for your kids, you're going to be doing it online. The good news is that most cloth diaper e-tailers (like retailers, but online...get it?) offer shipping incentives for orders over a certain amount, ranging from as low as $49 to as high as $99. And really, when it comes to ordering cloth, you can reach that total in a hurry. So where to? Here are some of my top choices for places to shop, order from, or even browse. IF YOU HAVE ANOTHER STORE THAT YOU LOVE, PLEASE SHARE IT IN A COMMENT!! Nicki's Diapers. This store has my heart. I think most fluff mamas end up really preferring one place over another, and ND has pretty much always had everything that I have wanted to try in stock. They offer free shipping on orders over $75, and they actually have a new "15-Day Wash and Return" option, to allow you to try out cloth products. If you don't love them, you can return your stuff for store credit, and she offers lots more than just diapers! Cotton Babies. This is another wonderful store, and I actually did the giveaway on here through them. They offer free economy shipping on all orders, every day. Jillian's Drawers. I have never actually ordered anything from JD, but the thing that I've always loved about them is that they offer a VERY comprehensive try-it-out kit, which allows you to try cloth diapers at home for 21 days. If you decided not to stick with it, you can return everything and get all but $10 refunded. Green Mountain Diapers. This is another site that I never actually ordered from, but I love their site! They have some really comprehensive and thorough information on prefolds, too, which is really helpful! And they have super simple, flat rate shipping. Kelly's Closet. Kelly's Closet has a very wide selection of products and prints. She also offer an incentive program, where you earn points for every dollar spent, and your points add up toward store credit for you to get free diapers! You also get free shipping on orders over $99. Nurtured Family. This is one of the first websites I ever looked at! They offer free shipping within the US on all orders over $75. They offer tons and tons and TONS of stuff besides cloth diapers! Banana Peels Diapers. I haven't ordered anything from here. Yet. ;) This site contains all my current wish list items. They offer free shipping on orders over $50, which is one of the lowest places around! And don't forget, if you're looking for gently used, pre-loved cloth diapers, you can always check out the forums on Diaper Swappers and the Diaper Pin. All these links should open in a new window. "Sooo....where do you buy those?" "How on earth did you learn all this? How do you keep it all straight?" Well, since my hope and the aim of my cloth blog is to help those parents who are new to cloth, and maybe just beginning their research, I thought I'd answer some of those questions as best as I can! How / Where do you learn about cloth diapers? Well, to be honest with you, after a few short conversations with IRL friends who used cloth, I felt a little overwhelmed. So I honestly just sat down at my computer one day, and typed "cloth diapers" into Google. 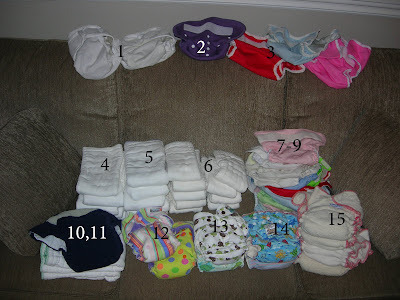 I started by going through all the online store sites, making notes (and notes, and notes...pages and pages of notes) about the different kinds of cloth diapers, the brands for each type/style, price comparisons between stores, etc. It was tough. Although I feel like I now know a lot simply because of the way I researched, I honestly don't recommend doing it this way, because it can be so overwhelming that some parents may abandon the idea of cloth diapering altogether. The Diaper Jungle - especially their Information Guide article directory, under the Cloth Diaper Articles tab on the home page. They also have a reviews page, and the BEST detergent comparison chart! The Diaper Hyena - this site was created by a mom, just like me! They also offer reviews, a FAQs page, a folding 101 page, and a very thorough article index for articles on every topic you could imagine. Diaper Pin - the #1 go-to site for reviews, in my opinion! They also have a FAQs page and forums for questions and discussions. Diaper Swappers - one of the best forum sites for cloth diapering, once you get the "threads" thing all figured out (for some reason this site was confusing to me at first). You have to create an account, but then you can read (and post) discussions on cloth diapering issues. Sometimes it's just so helpful to read what other people are dealing with. You can also buy and sell used diapers here. Additonally, most online cloth diapering stores feature sections on why to choose cloth, how to care for it, cloth 101, etc. You can also check out "mom sites" like CafeMom, where you can join groups for cloth diapering and post discussions and questions. DON'T GET ON THOSE CLOTH DIAPERING FORUMS AND POST SOMETHING LIKE "I'm really interested in switching to cloth diapers, but I'm totally new at this and have no idea where to start. Someone please help!!!" IT WILL ONLY MAKE PEOPLE FRUSTRATED AND IRRITATED, AND CHANCES ARE NO ONE WILL RESPOND TO YOU EXCEPT TO SAY, "LOOK THROUGH OLD POSTS ON HERE." So that's my top choices of where to look for information. Of course, there are tons and tons out there, but these are just my few favorites. Please feel free to leave a comment with the URL to any other great resources you've found! This post is not going to make me very popular with the super green and crunchy crowd. I'm sort of green...sort of "chewy," not quite crunchy. I pursue a lot of "green" living, a lot of self-sustaining things like doing baking at home, and mixing up my own cleaning concoctions (minus all-purpose cleaner spray, I stick with BioKleen for that). We recycle, and use mostly dish rags and only occasionally paper towels, and I'm planning to sew some linen napkins for us to use during meals. I've talked before about my love for Charlie's Soap, and I use it for all our clothes, although I have been thinking about trying making my own detergent. But sometimes, I really think it's okay to reach for some help in the cleaning aisle at a mainstream store. Back in my post about disinfecting, I mentioned that I spoke with Charlie himself. He spent a lot of time on the phone with me, answering my questions about disinfecting. At the end of our conversation, I happened to mention that where water tends to "sit" in our house (like the sink drain, the shower head, etc. ), I often saw a reddish build-up. 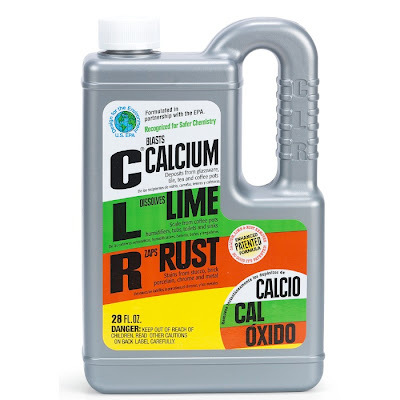 He said, "Well, it sounds like you have a lot of iron in your water, and that can cause a mineral build-up on your diapers - that could be why you keep on having repelling problems. You could try washing them with CLR." I was skeptical, nervous, apprehensive...but it made sense. He said to try from 1/4 to 1/2 cup in a full wash load of *clean* diapers. So last weekend I did it. I washed half of my clean stash with 1/4 cup of CLR and the regular amount of Charlie's Soap liquid detergent, and an extra rinse. I then did a hot wash cycle with 1 tbsp of Dawn original blue dish detergent, and a few extra rinses to get all the suds out. If you feel like you're consistently having problems, especially with repelling, this could be worth a shot for you. I'm not going to make it part of our regular routine, but if I begin to notice a lot of the diapers repelling, then I'll bust it out again. Remember, if you can see mineral build up in your sinks, then it's in your water. And it's in your washing machine. Even if you don't feel comfortable washing your diapers in it (although we truly are quite pleased with the results, and have no worries about residue due to the immediate subsequent Dawn strip and lots of rinses), you might want to think about running an empty wash load with some CLR in the water to help clean up your machine. Sadly, the first winner of this giveaway didn't contact me within the allotted time. :( The good news about that is that I had to choose another winner! This time, Random.org chose comment #12, K. Jones. Congrats K. Jones! Shoot me an email at diaperdiaries (at) hotmail (dot) com by 10 pm Eastern tomorrow night, Saturday the 3rd to claim your prize or I'll have to choose another winner. Marvels Fitted Diapers in designer prints – mostly in the lovely Mocca print, and some Zoo-Blue, at incredible prices! Kissa’s Fitted Cotton Fleece: in all three sizes – 0, 1 & 2. Kissa’s Organic Fitted’s: in Size 1 only (super absorbent and organic fabrics). Kissa’s Cotton Fleece Contours: both sizes, NB and M. Great for diapering on a budget. Wipes: Organic, Premium Organic and Awesome Terry (pick your favorite or at Outlet prices you may want to get ‘em all!). Doublers: both sizes- Boosters and Super Soakers (perfect for Size 1 & 2 diapers, pockets and g covers). Diaper Lotion Potion Spray: New Formulation with No Alcohol, No Parabens and No Phthalates. We will try our best to give you the colors/prints you specify for all items, including Free Bonus items, but reserve the right to ship from inventory at hand. FIRST COME, FIRST SERVE. Sale ends when we run out of stock. So go shopping! Hurry, hurry, hurry! This sale stock never lasts long!! According to the true random number generator on the main page of Random.org, the winner of the BumGenius Giveaway-Again is comment #19, Sarah Scipione! Sarah authors two blogs. One is called Dear Boys, and is a chronicle of her life as a stay-at-home-mom. (And seriously, check out her self-and-baby portraits in this post here - Sarah, could you be any more beautiful??) Her other blog is called Try It, You'll Like It, and is a collection of kid-approved vegan recipes - how fun and creative! So congrats to Sarah, and thanks to everyone who entered and shared their fluff fantasies with us. I would love, love, love to do more giveaways in the future, because it's always so neat to hear from people. Sarah, shoot me an email* at diaperdiaries (at) hotmail (dot) com with your information, and we'll get your BG 3.0 Ribbit on its way to you! * If I don't hear from Sarah by noon Eastern on Friday the 2nd, I'll pick another winner. For those of you who were around for my first giveaway...you get a second chance! Greta, the winner, has decided not to pursue cloth diapering. And she has generously offered to ship her (still brand new) choice to the winner of a new giveaway - Greta, you are so awesome! When she won she chose the BumGenius One-Size 3.0 pocket diaper in Ribbit. So, yes, the picture is huge, but you get the idea! Ribbit is kind of a grass green - great gender neutral color! So leave a comment - ONE comment - telling us (just for fun) the most extravagant item on your fluffy wish list to enter the giveaway. I'll leave it open until 10 pm Eastern on Wednesday, September 30, and then I'll use a random number generator to pick a winner. Good luck! If you've read my series of reviews, then you know I have a tempestuous relationship with velcro and aplix. As in, I hate it. I have several diapers that I love, except that the velcro is nappy and full of lint that I can't get out no matter how long I sit there picking. And somehow, even though the velcro is shot enough that the tabs won't stay closed, it's incredibly still sticky enough to attach itself to e-v-e-r-y-t-h-i-n-g else in the washing machine. And so a lot of my diapers look pretty awful from velcro snags from other dipes. Look at that velcro! It's so bad...it's just so bad. And this is after just one washing! I pick this junk out of the velcro every single time. So I decided to do something about it! At first, I thought about replacing all the velcro with aplix. And then I thought about having to do it all again in another year, and quickly scrapped that idea. I really wanted a snap press, but I just couldn't justify the cost. But one day when I was browsing on KAMsnaps, I came across a snap plier set! For just $30 (NO tax, and NO shipping! ), I got snap pliers and 200 complete snap sets. The customer service was friendly, and the shipping was really fast. KAM recommends that you watch their instructional videos online. The first video was about 6 minutes long, and so easy to understand. I sat down at the computer with my pliers and worked through everything as the video showed it. I couldn't believe how easy this was. It truly is as simple as using a hole punch. So today I sat down with my seam ripper and removed the velcro from one of our diapers in most desperate need of a makeover (DryBees Fleece overnights), and used another diaper with snaps as a template for snap spacing. Total time for diaper makeover was about 30 minutes! Here's my set up: A tv-tray, a Law & Order:SVU marathon, some diapers, and my new snap pliers and snap sets. Sweetness! You can see the 'before' on the left, and the 'after' on the right. I'm so thrilled with how easy this was, and how great the diaper turned out! This is a really easy way to rejuvenate older diapers, but if you're not into DIY, there are plenty of snap services available. Mama Momo offers reasonably priced snap services, and on Very Baby, there's a directory of WAHMs who likewise offer snap services. Let me know if you try this out. I think if you do you'll be very pleased with the results. 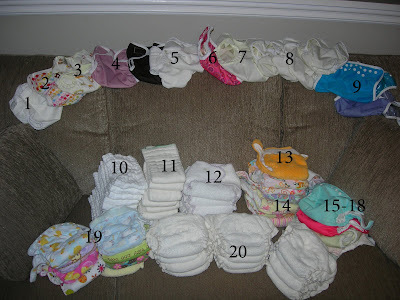 A couple of posts ago, I had a question in a comment about what to do about night-time cloth diapering. The mother said that her baby would wake in the night, but would quickly return to sleep after a diaper change. Obviously, this is no good, both for the baby's sleep...and the mama's! And of course, you don't want to establish a routine of night-waking if it can be avoided. Anyway, I don't know if I have the be-all, end-all answers to night-time cloth troubles. But let me tell you that my kids can flat out SOAK THROUGH a diaper. When my son was 18 months old, he would "pee out" (my own gross little expression for soaking through a dipe) a Happy Heiny with both inserts during just a 2-hour nap. On a regular basis. So we had to find another solution. After multiple trials and errors, I feel like I've hit upon a couple of different approaches and hints that really work for us. So let's say that you have a premium infant prefold (blue edge), and you lay it out long and fold it into fourths. (In half, perpendicular to the seams, then in half again.) Let's say, for the sake of example, because I've never actually measured it, that this folded up prefold was 1" thick. If I had microfiber towels, and stacked them together to make 1" of thickness, it just wouldn't absorb as much, thereby giving us more time per diaper. For my 3 y/o's just in case diaper overnight, I use a toddler-size prefold. And it is such a badonka-diaper. But he doesn't seem to mind, because to him, it's just his nighttime routine. It would have to be a very rare occasion that this prefold didn't make it through the night. Like if we let him have an extra cup of water/juice/watered down sweet tea (welcome to the south Honey, pull up a chay-air) before supper, then he might wet a little more overnight. Have you ever wondered why hemp and bamboo diapers are a little pricier? One reason is because you get what you pay for! :) The other reason is probably the current cache of those types of materials, but that's another rant for another post. So, now I have a stack of absorbent material: hemp on the bottom, prefold in the middle, then microfiber on top. And here's a little secret a lot of parents may not know about: The order matters! Microfiber and prefolds are fast absorbing, while hemp is long absorbing. So when I stuff the pocket, I put the materials in with the microfiber closest to her bum. If a baby feels wet, they're naturally going to be uncomfortable. So it is essential that whether you use fitteds, pockets, or AIOs overnight, the layer next to your child's skin needs to be a kind of material that will wick moisture away, giving your child a more comfortably dry feeling. This will also help to cut down on the rashes that we sometimes see after our babes have a long, wet night in one diaper. For most pockets, this isn't a problem. In most pocket diapers, the layer designed to be next to your child's skin is either polyester fleece or suedecloth. Both of these work great, although some parents may find that one is more effective over the other for their kids. Just try it out and see what works. Now, if you're already using this kind of diaper, and it doesn't seem to be enough, you could also try using an additional wicking layer. The easiest and cheapest way to do this is with fleece. You may even have some un-needed polyester fleece baby blankets laying around that you could cut up. Just use an existing diaper as a template for shape and size, and cut out several liners. Fleece doesn't ravel, so you don't need to do anything to the edges! :) If you don't have any extra blankets, check the goodwill stores - or even your own closet - for an old fleece pullover. Then just place the fleece liner in between the diaper and your child's skin. I know that this doesn't really apply to the original question, but I may as well include everything within my perspective on nighttime cloth solutions. It seems 100% counterintuitive. I know it does. But trust me. Go with me on this one. Fleece and wool covers and outers will provide an infinitely more leak-proof system than PUL ever can. I don't understand it. I wish I did. But all I know is that when we switched to cloth diapers for my son, he would wake up with wet jammies and sheets every single morning until I ordered some DryBees Fleece Nighttime Pockets. Then we were wet free!! I did have to change him immediately, because if he sat down in his pj's and wet nighttime diaper, he'd have compression leaks. But that's really my own fault, of course. I think it has something to do with how these fibers breathe a little bit naturally, so maybe the wet is evaporating...? Although that's a bit strange to think about. You can get fleece pockets, like the DryBees, but you'll want to replace the velcro either with better Aplix or snaps. You can also get fleece covers for fitteds. Unfortunately, I don't have any personal experience with wool...YET. :) I'm about to be brave and go for it when life calms down. Which will never happen. So, what I really mean is when I get my nerve up and get a chance to talk to some friends who use wool. So there's my spiel about nighttime cloth. I hope you guys have found some of it helpful! I don't have a lot to say about diaper sprayers. When I first started cloth diapering, I read about diaper sprayers and thought, "Oh wow - that's really cool!" And then my husband said, "Let's try cloth diapering without one. If you really feel like you need it, and you're definitely going to stick with cloth, then we can look into it." And you know what? Before I knew it, washing out poopy diapers wasn't a really big deal. I got an extra pair of yellow kitchen gloves, and wrote "BATHROOM" in thick black permanent marker on them, and donned these whenever a diaper needed washing. I dumped, dunked, swished, and used the cloth wipes to wash out the poo. No big deal! Really, truly. No big deal. If you have a regular toilet, this is plenty sufficient! Then we got low-flow toilets. With a suuuuper low water level. Suddenly I was having to flush the toilet 5 and 6 times per poopy diaper. Not exactly a water saver, you know? So I ordered a diaper sprayer. It changed my life. Or at least my diaper laundry. Seriously, I got along just fine without a diaper sprayer for a very long time, and the only reason I got it was because of our toilets. The water pressure is incredible, and I got one with an adjustable valve, so I don't have a problem with spraying poo-water all over the place when I wash out a diaper. And, I actually use the sprayer to rinse out all the dipeys, even just the wets, so we have less pailing work to do now. Sweet! Usually, I don't really talk about my family, or my other blog on here unless it's relevant. And really, this isn't relevant, but it might help the tremendous headache I have right now. Because a few of you were already following both. I decided to change my family blog's URL, but I didn't give people much notice. So I'm trying to get the word out without contacting every single person in my following list, every single person on my facebook friends list, every single person who has ever commented on my family blog...you get the picture. But this update will show up for those of you who are followers on here or have my cloth blog in your blogroll. Do you see where I'm going with this? Here is the new link for my family blog, Thread by Thread. And if you aren't yet a reader of my family blog, but see something you like over there and want to stick around, go ahead and click that follow button. And while you're at it, if you read this blog but aren't yet a follower, please click that little button! There's nothing to it, but the more followers I have, the greater the chances are that I'll keep writing on here. ;o) So go on and follow, and if you haven't yet, please leave a comment saying hi, telling me about your cloth experience and philosophy, or even asking questions and letting me know what you want to know more about. Whatever it may be, I love to hear from you guys. Does your cutie patootie have a fluffy bum? Do you love to show everyone how precious your diapers (and your kids) are?? Do you like to win free stuff??? The Real Diaper Association is holding a contest called the Real Diapers, Real Babies Photo Contest. All you have to do is fill out the form, and submit a photo of your precious little tater tots wearing a fluffy diaper. There are a few specific requirements and limitations on the photo, including size (in pixels). And please note - especially all you I ♥ Faces folks - that you may not photoshop effects onto the photo - the only editing that will be allowed is cropping, red-eye removal, and adjusting the contrast/brightness. Anyway, back to the good stuff! You must submit your photo by no later than August 24th, 2009. Then members of the RDA can vote on the photos. You can generate buzz about your child's photo by asking friends to become members and vote (one vote per person). The top 12 photos will be used for a Real Diapers Calendar, the proceeds of which go toward cloth diaper advocacy and education, as well as promoting the use of cloth diapers in daycares - woohoo! BUT, the big prize is this! The top winner will receive either a digital camcorder, or a $150 gift certificate to Kelly's Closet! The 2 runners-up will receive a $50 gift certificate to either Babies in Bloom or Mama Momo. So get your favorite diapers washed and ready, and get your little ones in a happy mood to take some fabulous photos. And after you've submitted your own photo, go to the Real Diaper Association blog to check out other cutie patooties. Just wanted to let you all know about a great giveaway being hosted by Beth at Happily Domestic. Beth has a beautiful blog where she shares all about being a wife, mom, keeper of her home, daughter of God, homeschooler, and of course, cloth diapering! Right now, Happily Domestic is hosting a giveaway for one of their family faves for diapers, a one-size Haute Pocket! It's easy to enter, and easy to get extra entries too. Please be sure to stop by, become a follower, and enter her giveaway. The contest runs through next Friday, the 14th, so you still have plenty of time! Really, I've been dragging my feet on blogging about this, because I was quite embarrassed that I had been a cloth diapering mom for a year and a half and never knew that I was leaving a huge step out of my system: DISINFECTING the diapers. I always thought that if they looked clean, and smelled clean, then they were clean. And that when they started to smell a little funky, it was time to strip them. End of story. Well, I was wrong. At least twice a month, you should be doing something to disinfect your diapers. I actually called Charlie's Soap to ask them their recommendations. Would you like to know who I spoke to? Yes, Charlie himself answered the phone. He was so friendly and helpful. He said that there are several different ways you can choose to disinfect your diapers. Some people prefer to use hydrogen peroxide, but Charlie told me that the amount of hydrogen peroxide you would have to use to disinfect an entire washer full of diapers would probably bleach everything out. Some people use vinegar to disinfect, but again, the amount you would have to use to disinfect is, well, a LOT. Honestly, a lot of folks aren't going to like this, but according to Charlie (and in accordance with my own common sense), the best way to disinfect your diapers is to use between .5 cup and 1 cup of bleach along with your regular laundering routine about twice a month. I know, I know. You've heard bleach is bad for PUL, or elastic. Or you're worried it's going to fade the cute print fitteds you have. I was concerned about this too. But the truth is, PUL and elastic don't have infinite lifespans anyway. And I don't care if my print diapers stay bright and brand new looking if they're riddled with funk that causes nasty rashes on my kids' bums. You can also use an oxydizing "bleach," like Oxy-Clean Free powder laundry booster. Charlie didn't seem to think that this method was quite as effective as regular liquid bleach, but recognized it's a more acceptable option to many circles of parents. I also asked him about using essential oils, and things like Grapefruit Seed Extract, to disinfect diapers. He admitted that he didn't know much about them, but he cautioned me that oftentimes, the people doling out advice on essential oils may not know as much as they claim to know. Additonally, you'd probably have to use a LOT of oil or extract to achieve disinfection in a washing machine full of water, and some have potential adverse side effects on very young babies, male babies, etc. If you're using essential oils that come into contact with your children's skin, please let me encourage you to do some thorough research from unbiased sources. That is, don't glean all your information from a website that sells the stuff! And overlap your research from different places, seek out certified herbalists, and search specifically for cautions and warnings. I think many EOs are great, but when it comes to using them topically/medicinally, I treat them with as much respect and caution as I do over-the-counter drugs. Anyway, don't be like me. Don't just think that they're clean because they look clean. Disinfect your diapers! Okay, I'm sorry. Last post I had a teaser about laundry routines and Charlie's Soap, and I know I haven't delivered yet. I will get there. Keep using your Charlie's. I'll get to it. A friend (and DD follower) sent me a facebook message asking if she should not use Charlie's, and the short answer is this: Charlie's Soap is so awesome and wonderful, and the problem I need to address has nothing to do with them specifically. More, the problem is that CS gets diapers so clean that you may not realize that your diaper washing needs another step. That other step is disinfecting. I'm going to write all about it another day. First, I want to tell you that Cotton Babies is extending their fourth of July shipping promo through tomorrow, July 7th. Just use the coupon code FIREWORKS to get free economy shipping on any order! Second, I need - NEED - to tell you about a new fitted diaper that I want to try. I am all about fitted diapers, as you may have gathered. I use pretty much only fitteds and prefolds during the day, and then we use our pockets for naps and overnights. But I don't want a million different sizes of fitteds, so I'm always on the lookout for one-size fitteds. Well Kissaluvs, the maker of my faaaavorite newborn fitted diaper, has come out with a one size (10 to 40 pounds) fitted diaper called the Marvel. It's constructed much like their sized fitted, with 3 body layers and a microfleece soaker, and comes in three precious prints. It's a little pricey at $24.95, but most one-size fitteds are. The only place I've found them so far is at Kelly's Closet, which happens to be one of my top places to shop anyway! Here's the page for the Marvels at KC. Speaking of Kelly's Closet, I don't think I've ever written on here about The Cloth Diaper Whisperer, although I'm sure a lot of you are well aware. The owner of Kelly's Closet maintains a great and informative cloth diapering blog, and hosts fantastic giveaways every single Friday! Check it out! This week's giveaway, which will end on Friday, is for the new Kissaluvs Marvels. Okay, I need to run. Happy Monday to everyone! First, thank you to so many of you who responded positively to my post on natural birth control via the Fertility Awareness Method. I am so overwhelmed (in a good way) by the positive support and many questions I received here, in my private email, and on facebook. You guys are awesome! Let me encourage you to continue reading and researching - get the book, ask some questions, maybe even find a class at a hospital or women's health center that teaches the method. I'm so excited that boiling all our stash got the diapers so clean that they could pass for new, and the PUL was entirely unaffected by the process. I'm sure that repeat boilings would not be good for it, but hopefully I won't have to go through that again. I have a post coming up about our new wash routine and WHY we have a new wash routine. (All you Charlie's Soap users will definitely need to tune in for that one.) But for now, Hubby has the kids at a family reunion, and I have a quiet house and lots of sewing to get through. Shifting gears a little bit right now. I'm excited that today is the day that I finally get my little one back in her fluff after a month in sposies; this month has been riddled with bacterial infections, fungal rashes, and more painful procedures than I care to recount. I have an upcoming post planned about my NEW system for caring for cloth, but today I want to talk about something that's really important to me. Since birds of a feather tend to flock together, as it were, I think that it's a pretty safe bet that a lot of us cloth parents may be concerned about choosing natural alternatives to the things that most of us do anyway. From using cloth diapers to changing the products we use to clean our homes...to birth control. There is just so much about the scientific mechanics of birth control that I do not know the ins and outs of, and I will be quite honest with you. I won't pretend to know things that I do not know. But I DO know that taking hormonal birth control pumps your body with artificial, synthetic hormones day in and day out, often for years (depending on personal usage). How could we ever have thought that this was good for us? Let me give you a little background, and then I'll get back to what I do know about hormonal birth control methods (e.g., the pill, the patch, nuva-ring, mirena IUD, etc.). If you have never figured out from my references here, or checked out our family blog that I also author, I am a "soul'ed out," through and through Christian, and unwaveringly pro-life. When my husband and I were engaged and I began considering the prospect of employing birth control, I simply felt uneasy in my spirit at the thought of taking "the pill," but didn't really know why. Against my better intuition, I took it anyway, starting a few months before our wedding and continued to do so through the first 6 months of our marriage. Let me just say it would be an understatement to say it made me crazy. In case you didn't know, Ob/Gyn nurses call Ortho-Tricyclen "Ortho-Try-Psycho" for a reason. The birth control pill works in 1 primary way and 2 secondary ways: (1) prevents ovulation; (2) thickens cervical mucus to prevent sperm from passing through; and (3) alters the endometrium, aka the uterine lining, to prevent the implantation of a fertilized egg in case the first 2 methods fail. I believe that life begins at conception. If I am taking a birth control pill that could possibly "prevent the implantation of" (aka "abort") a fertilized egg, then this medication is in serious conflict with my beliefs on the sanctity of life. Now, Dr. Husband's position on this issue is that you could never, ever verify that a "period" is a result of a failed implantation of a fertilized egg. But my position is that you could never verify that it wasn't, and I do not believe that it's worth the risk. So, let's just get the most well-known NFP joke out of the way, shall we? What do you call people who practice natural family planning? Parents. Seriously guys, there's a better way. It's not the archaic, ineffective rhythm method, and it's not a lot of work. It's called the Fertility Awareness Method, and you can learn all about it in this wonderful, easy-to-read, and often humorous book, Taking Charge of Your Fertility by Toni Weschler. The Fertility Awareness Method is an easy to learn system of charting both physical symptoms, such as cervical fluid and position (if you're so inclined, haha, pun very much intended), and your waking temperature. Through utilizing FAM, you will learn how your body actually works, and no longer be mystified by the changes your hormonal fluctuations render on your body each month (and the resultant fluid variations most women undoubtedly already notice). FAM, when practiced and applied correctly is around 98% effective at preventing or prolonging pregnancy, so it's comparable to most birth control pills, and actually MORE effective than barrier methods (such as condoms, diaphragms, etc.). Charting isn't a tremendous chore, but if you think you won't want to keep up with it, there's a free online help: Fertility Friend. There you can log all your information in, and it keeps track of it for you. Then, if you ever need or want to, you could just print out your charts and carry them into your Ob/Gyn's office for a consultation. Birth Control: headaches, weight gain, nausea, depression, mood swings, chronic migraines, blood clots, heart attacks, breakthrough bleeding, and negative changes in sexual desire. For all this you pay between $2000 and $4000 out of pocket (after insurance, if you have any) over a 10-year span, and possibly face months of waiting to conceive after stopping the pill while you wait for your body to begin "working" again. And its efficacy of around 98% is only guaranteed if you take it at the exact same time every day. Fertility Awareness Method: take about 1 minute each morning to take and record temperature, 5 to 10 seconds to check cervical fluid before using the restroom 2 or 3 times a day, 5 minutes to write everything down each day. For this you spend about $10 on a good basal body temperature thermometer, and incalculably negligible pennies a year on pencils and paper to keep track of your charts (or use the free Fertility Friend). Its efficacy of around 98% is guaranteed when you follow all rules and principles, and you are free from the "Am I?" worry and anxiety that panics women daily. Hope this gives some new folks something to think about. I'd love to hear from you guys on this issue, but please, let's keep the comment discussions friendly! I just got an email from Elissa over at MonkeyBuns letting me know that she's having a SURPRISE sale today and tomorrow: 10% off of everything, no coupon code required! If you've been wanting to try out some fitted diapers, and love the idea of supporting a WAHM, please take advantage of this weekend's MonkeyBuns sale!! Earlier this week, I had some friends over for a diaper demo. Now, I love to do diaper demos! What a helpful thing it would have been for me to pursue a demo from a cloth-diapering parent when I was doing my research. I really love to talk to other parents who are curious, interested, researching, or preparing for the plunge of changing to cloth, because to read about this stuff online and to see it in person are 2 totally separate things. And, it seems like a lot of parents talk about cloth diapering in really vague terms, and say things like, "Oh, I don't really know. We just decided that we wanted to use cloth and so we did." And I was left thinking, "What?!? That's all there was to it? What about styles of diapering? Brands? How do you take care of them? What do you do with the dirty diapers until you wash them??" and a million other questions. For those who are reading who are currently cloth users, I really encourage you to spread the word! Talk to other parents about cloth diapering, and offer to do a home demo for them. You might be surprised how interested people become. Anyway, partly in preparation to do my demo, and partly because I had to boil all of our diapers when my daughter had an awful rash, I was able to get my entire stash in one place. MY ENTIRE STASH. I have all the diapers split up into newborn/small stuff that my daughter wore in the beginning (because remember, I didn't switch until my son was 18 months), and the diapers that she wears and that my son wears at night now. Hoo boy. I want to share my stashes with you, but please remember to do as I say, and not as I do. I have a lot more diapers than I realized I did. And really, we have more than we need, but I have a hard time letting go of things, so nothing is up for sale at this time. YOU DO NOT NEED AS LARGE A STASH AS I HAVE IN ORDER TO CLOTH DIAPER YOUR KIDS! But if you're a little nuts, like I am, then you might want to. ;o) I am not going to link each product, because that would take me forEVER. If you use the customized google search box on this page, you can find most of these products. If you try that, and can't locate something, contact me and I'll get you hooked up with where you can find that particular product. And that's not to mention all our various and sundry inserts, doublers, microfiber towels, and cloth wipes. Which were not folded. But I took a picture anyway. There's quite a lot. When it's all folded, all the stuffin' material completely fills up one drawer in a nursery-sized chest of drawers. So there we go! Our diaper stash. Now go find someone to do a diaper demo for! Here and there, I've had questions from folks about boiling diapers, whether for stripping or prepping. And I've seen on my sitemeter that some people are stopping by here because they googled "how do i boil my diapers?" and my blog comes up. I've been boiling diapers today. This is hot, hard work! It's exhausting! Let me give you some background as to why I did it, how I did it, and why I don't really think you need to do it. About 2 or so weeks ago, my daughter started having a really strange diaper rash. It looked like big nasty zits, or mouth ulcers. I noticed that it started on one side, and transferred to the other side, where her skin was pressed together when her legs were closed. We were suspicious of it being bacterial, but it cleared up with the use of a barrier cream and some rice paper liners. Then it came back. And cleared up again. And came back AGAIN. With a vengeance. Fiery red. Bleeding. Open weeping places. And the pimply things again. I was pretty certain it was bacterial, so we switched to sposies, and started using an antibiotic ointment (neosporin, or bacitracin if you've got it) along with a barrier cream, and lots and lots of clear water baths and naked time. She is finally cleared up, but the thought of there being anything lingering in her diapers that could cause her to break out again had me determined that I needed to do something drastic. On the right front eye of the stove, I had the stockpot with boiling water. On the left front eye, I had a slightly smaller stockpot with a colander resting in the top of it. On the back left eye, I constantly had a kettle of water coming to a boil. Sitting just beside the stove, I had a tall chair with my hanging diaper pail stretched over the back of it, with a mixing bowl set beneath (my hanging pail isn't super water-tight). I would cook the diapers for about 5 to 10 minutes after the water returned to a boil, then remove them with tongs to drain in the colander. While they sat and drained, I would start the next "batch" of diapers cooking. Then, when the the diapers that were boiling were ready to come out, I would remove the drained diapers from the colander to the hanging pail, which was drip-drip-dripping into the bowl beneath. As needed, I would refill my stockpot with boiling water from the kettle, and refill the kettle so I would have hot water ready for me the next time I needed to refill my pot. Once I finished boiling about half our stash (8 or so "batches"), I put it in the washing machine for one of our regular diaper wash cycles with Charlie's Soap. I still have a little less than half of our stash to boil, and then I can wash them and I'll be done! Now, those suckers are clean. So clean they could pass for new. And I'm glad that I can start putting my baby girl in her fluff again with a mind fully at ease. But all that said, for the time and the work involved, I really wouldn't recommend boiling your diapers unless you have a really compelling reason, as I feel we did. There were a few things that made me apprehensive about boiling. One, I was worried my snaps would melt. (They didn't.) My other big concern was that it would compromise the PUL on my covers and pockets. The jury's still out on that one, as the first half of our stash is drying as I type this. I'll be sure to add a postscript to let you know how it goes. In the meantime, though, just stick with the regular wash routine and machine stripping! Augh! At long last I return to my product reviews! I've previously reviewed the prefolds, fitteds, and covers that I've tried and/or use. Now I'm excited to get down to the main staple and workhorse of most of the cloth families that I know: the pocket diaper. Remember, a pocket diaper is a feel-dry liner sewn to a waterproof outer layer with one end open, leaving a pocket that you stuff to customize your child's absorbency needs. ** You're going to see very clearly in this post, just in case I've never said this before, I'm just a real mom. I have no affiliations with any companies or products, and no loyalties except to the products that I've fallen in love with. Let's just get this one out of the way, shall we? I'm not even linking to their site. I started out loving these diapers: a one-size with snaps, which - for some reason completely unbeknownst to me - was hard to come by when I first switched to cloth diapers. They were well constructed, a perfect fit, and hard-working diapers. For about 8 months. Then I started having problems. At first, I thought my son was overflowing these diapers, which I tried to correct by stuffing with more/different materials. But his clothes still ended up wet. I did some research and contacted the diaper company, and they advised me to strip the diapers. They started "working" again! For about 2 weeks. Repeat. Ad nauseum. And I was nauseated with hand-stripping diapers once a month just so we could keep using them. My kids' clothes (by this time my son was potty trained, and my daughter was in the diapers), would end up wet, but the stuffing of the pocket was basically bone dry, which indicated a problem with repelling. So I contacted the diaper company again, who told me to strip them. I informed them that I already had, about 100 times in as many different ways. I told them that I was using a cloth-safe laundry detergent, no softeners, no rash creams or vaseline, and let us not forget the clincher: I WAS NOT HAVING PROBLEMS WITH ANY OF MY OTHER BRANDS OF DIAPERS. Their "answer" was that they had never had any complaints before, and they didn't have anything else to offer me. Now. Apart from the fact that these diapers failed within a year of correct use, I cannot support a company with such deplorable customer service. Any company, particularly one with proclaimed integrity, should have offered to replace the diapers. At the very least, they should have offered to let me send my dipes in so they could take a look at them for themselves. After too many emails and unreturned phone calls, I decided to abandon ship. I will NEVER buy from them again, and I recommend that you do not buy from them either. There are too many other companies out there who actually care about their customers for you to waste your time on Tiny Tush products. However, they do still get .25 thumbs not down (but still not up), because I'm using the diapers (and selling a few, in anyone is interested) for cloth swim diapers. Mommy's Touch Easy Clean One Size Pocket - 1.5 thumbs up! The only thing I don't love-love-love about this diaper is that the wing/tab part is kind of wide. Not that big a deal. If you're in favor of snaps, these are a great choice! They also come in velcro/touchtape...but why? My only real complaint with these diapers is that I feel they're cut smaller and trimmer than other one-size diapers, and as a result, my son grew out of this diaper (which was supposed to fit up to 35 lbs) long before he hit 30 pounds. If you've ever checked out our family blog, you know that my kids are anything but small and trim! Hautes are also available with either snap or velcro closure. What can I say? Even people who don't cloth diaper have heard of bumGenius. These are some of the most well known modern cloth diapers. Superior construction and fit, gorgeous colors in soft and bright shades, and a super-soft, no-pill suedecloth lining. A few cons: these are not sized quite as large as other one-size pockets, and the pocket itself is not overly generous. So you can't stuff it tons and tons. But the big thing is, the velcro issue! BumGenius uses some of the highest quality Aplix/touchtape velcro, but even that will eventually wear down and wear out. Happy Heiny's are, to me, just as well known as bumGenius diapers. Lots of colors and cute prints, and a very generous fit. Even my 41-pound son can still fit in one of these when it's stuffed with a toddler prefold and a hemp doubler. Pretty impressive! A few cons: the fleece pills in just 2 or 3 washes. And, the velcro, once again! Velcro is made for convenience, not longevity. Happy Heiny's now offers their one-size diaper with snaps, but I don't have one. It appears to be a bit different in construction, based on the photos I've seen. Happy Heiny's also makes sized diapers, but I haven't tried them. FuzziBunz are another well-known name in the world of fluff. Maybe they were some of the modern cloth pioneers, maybe there's a cachet with having a FuzziBunz, maybe just because the name is so cute. But honestly, I don't see what all the hoopla is about these diapers. Yes, they're well-made. They have lovely colors. They work great, and clean well. Easy on, easy off. Easy to take care of. But I think it's sort of like how I didn't see Jerry Maguire until about a year after everyone else did, and I had just heard for a year how it was the greatest movie ever, so when I finally saw it, my reaction was a very underwhelmed, "...Ehhh." Also, though, now that they make a one-size FuzziBunz, why would you ever want to buy an entire set of pocket diapers in 3 (or 4) separate size groups, spending 3 or 4 times as much money in the long run? When we switched my son to cloth at 18 months, he was a nighttime super soaker, so I definitely had to give this diaper a try! Fleece breathes naturally and really is a wonderful overnight solution. These are sized diapers, and my son (who, as I said earlier, is 41 lbs), has been in the large size from month 19 to now one month before his 3rd birthday. They have a very generous pocket with ample room for super-stuffing. They fit great, and are our mainstay night diaper. DryBees uses perhaps the lowest quality of velcro available, except what you can buy in the scrapbooking section at WalMart. Actually, the incredibly poor quality of the velcro on these diapers has been a major contributing factor to the early destruction of the velcro and Aplix on our other diapers. Big. Fat. Boo. When I remember, I safety pin the tabs down before I wash them so they won't tear up the other diapers. So there ya go! My pocket reviews! I also use and love some all-in-one pockets, but I'm going to include those with the all-in-one reviews. Today and tomorrow (May 20 and 21) ONLY, get free shipping on all orders $35 or more at Kelly's Closet. This is a steal!!! Usually free shipping doesn't kick in until orders of $99 or more at KC. Just enter coupon code FACEMAY at checkout. Kelly's Closet has become one of my favorite diaper shop e-tailers. She has a lot of different products available in one place, and quite a few things that I've never found anywhere else, like KiwiPie fitted diapers. Their customer service is always friendly and prompt, and they even have a live-chat option where you can ask questions to a customer service rep in real time - fabulous feature, especially for newbies! They also have sewing patterns for sale, if you're so inclined to make your own fluff. For expectant moms, Kelly's Closet has a gift registry option that will allow you to create a cloth wishlist. And of course, there's a whole lot to shop for other than diapers! Take advantage of the 2-day shipping sale - happy shopping! Okay, so I'm here to let you know about another giveaway! My bloggy friend is hosting a giveaway for a fabulous revolutionary pocket-style diaper. Be sure to enter and take a moment to browse around her blog. She's a super-cool, creative, crafty, crunchy (or chewy?) Mama to Baby C. Good luck! Okay, my fluff friends. I need some help from the Elimination Communication crowd. My daughter has decided that she is done with pooping in diapers. We are now 6 for 6 on pooping in the bath, and tonight when she got out of the tub, in the FIVE MINUTES of naked playtime I was letting her have, she squatted down and pooped on the floor. I've tried helping her to "squat" on the toilet seat by supporting her under her arms with her feet on the seat, but she kind of freaks out. I'd like to take this opportunity by the horns, but I just don't know that much about EC. I've known since she was just a few months old that she would be physically capable and mentally inclined to potty train young, but I just don't know what I'm doing here. I've potty trained a toddler, but this is kind of foreign territory to me. Just send me an email at diaperdiaries@hotmail.com with your choice of diaper, size (if applicable), and color. Oh, and your address. Here we go - another sale! One of my most favorite work-at-home-moms, the creator of MonkeyBuns Diapers, is offering a Mother's Day special of 10% off all orders of $50 or more! Just enter coupon code MONDAY at check out. The sale goes from today, 5.7.09, through Mother's Day Sunday, 5.10.09. And don't forget about entering the pocket diaper giveaway right here! Okay, my fluff family! I've promised you before that I will do my best to pass along sale and clearance info from the newsletters I get from the cloth sites that I subscribe to, so here you go! Tomorrow, 5.6.09, the Kissaluvs Outlet Store will open! They say they'll have great prices on fitted diapers, contour diapers, wipes, and more. They'll even throw in a bonus freebie with every purchase! It could be a doubler, wipes, or even the diaper lotion potion spray. Until tomorrow, the link will direct you to their bundle-package deals, but beginning on May 6th, the link will take you directly to the Kissaluvs Outlet Store. If any of you remember my reviews on Kissaluvs diapers, they received a hearty 2 thumbs up from me. Many veteran cloth mamas and daddies will tell you that if you could have only one diaper in your stash for a newborn, the Kissaluvs fitted size 0 would be it! I really loved these for my newborn, and I even got some size 1s for after she grew out of the 0s. Anyway, I wanted to pass the word along. Please come back and leave a comment to let us know what you snag! And don't forget about the giveaway - open through Mother's Day! Here we go with another edition of crunchy cooking at the Diaper Diaries! Please don't forget about my giveaway - entries are open through Mother's Day, Sunday May 10th! Granola is delicious and basically good for you. It's high in fiber, and you can boost the nutritional content by adding different things to it. It's great for breakfast, as cereal with either milk or yogurt. Actually, granola and dried cranberries in milk is probably one of mine and Husband's all-time favorite cereals. Granola is a fun topping for ice cream or frozen yogurt, and it's delicious to just eat a few handfuls by themselves as a snack. Obviously, my recipe is for "loose" granola rather than bars. I've yet to try a good granola bar recipe at home, they always taste raw in the center to me. ...but be patient, and go slowly, or you will slop oil over the sides of your bowl! Soon it will come together and look smooth. At this point, whisk in vanilla (if desired, it's optional). I just use "some" vanilla. When I pour it in, it looks like it's about a tablespoon. In a separate large bowl, mix half of your dry ingredients: one half of a large can of old-fashioned (NOT QUICK!!) oats, half a bag of sliced raw (not toasted) almonds, half a bag of sunflower kernels. Make sure you buy the bag (6 oz) of sunflower kernels, and not the 7.25 oz jar, because the jarred kernels are tossed in a spice mixture for tasty snacking and salad topping. Here is my super high-tech way of estimating half a bag: I flatten it out, put my hand about halfway down, and then pour out the nuts to where my hand is. You can also add your optional dry ingredients at this time if you wish. I use powdered milk for vitamins A and D, calcium, and potassium. I use wheat germ for vitamin E and folic acid, and flax seed for extra fiber and omega 3 fatty acids. I just use a scant 1/4 cup of each. Mix half your dry ingredients together, pour half of your milk mixture over oat mixture and toss to mix well. Grease and flour (or spray ^ with cooking/baking spray) 2 to 3 large cookie sheets or jelly roll pans. Has everyone heard this tip before? When you're using spray, open your dishwasher and place pans on the inside of the dishwasher door, so that the excess spray goes inside the dishwasher instead all over your counter or stovetop. Although don't do this if the dishes in your dishwasher are clean. Remember, I wouldn't tell you something like that unless I had done it. How large your pans are will determine how many you need. I use 3. Be careful! If you use 3 pans, the granola will not be as deep in the pans, and may brown much more quickly! Anyway, after you've mixed half your granola, put into prepared pans. Repeat with remaining half of dry ingredients. This is what a scant 1/4 cup looks like, by the way. Mix dry, toss with milk mixture, put into remaining prepared pans. Put pans into preheated oven (anywhere from 225* to 300* F), and bake for up to 3 hours, tossing every 30 minutes. If you're baking the granola at 225* F, which I recommend, your total baking time will end up being around 3 hours. Baking it lower and slower allows the oats and nuts to really cook, and baking low and slow brings out a delicious nutty flavor in the sunflower kernels that lends a peanut-buttery flavor to the granola. If you're in a hurry, you can bake it at a higher temp, but I would stir it every 20 minutes instead, and your total bake time will end up being more like 2 hours. When you stir and toss it, rotate your pans around in your oven, because all ovens have hot spots! Or you could be less so. For tossing the granola, I like to use a heat-resistant rubber scoopula (concave spatula). It's gentle on my pans, and effective at scooping, stirring, and redistributing the granola around. You want to scrape the granola from the outside of the pan to the inside, pushing what was inside out to the edges. Toss it well, and check for browning. Return the pans to the oven. Find something else to do. This does not make the time go faster. Still waiting, two hours in. Last half hour! I think it's going to be ready this time! Mmmmm, see how rich and brown this looks compared to the picture of when I was stirring it? The top right pan actually got a little too done, but it still tastes great. When you have multiple pans in the oven, it may be that one pan is ready to come out before the others. You'll know when it's done. Pay attention to your nose, too, because right when it's ready, you'll kind of suddenly smell the sunflower kernels. Let cool completely, and then put into storage of your choice. I usually use this tupperware thing, which will hold an entire batch of granola, but it's home to Little Lady's "oh-oh's" right now. So instead, I put half the granola right back in the oatmeal canister, and half into a clean, reusable animal cracker jar. You could also use gallon ziploc bags. Enjoy! Whisk oil, milk, and vanilla if using. In separate large bowl, mix half of dry ingredients, and toss with half of milk mixture. Pour into greased and floured jelly roll pans. Repeat with remaining half. Bake at 225-300 F for up to 3 hours, tossing every 30 minutes. Make it your own! If you like cinnamon, add some cinnamon. Or nutmeg. You could experiment with different flavor extracts and oils. I wonder if cocount oil would be really tasty...? Or in what proportion to put peanut butter into the wet ingredients? Let me know what you do to make the granola a perfect fit for you!